Exists to see that aspirations of people in Indigenous communities of remote Western Australia are achieved through music. Desert Feet Tour are creating a collaborative project to produce an album for Olive Kankawa Nagarra Knight (a regular indigenous facilitator with DFT). Olive seeks to heal through music and stories, in language and translated, exploring synergies between modern and traditional life, speaking of determination in spite of loss. Desert Feet Tour pitched at TFN Perth to raise funds to record 'Heroes & Laments': Kankawa Nagarra (Olive Knight)'s unique blend of gospel blues, mixing the traditional stories and language of the Walmatjarri people with a contemporary musical style. 'You’d think she was a Mississippi blues shouter if she wasn’t telling Kimberley stories. A total original with a lot of heart and soul - and a blast to work with' -Lucky Oceans. TFN sponsored Desert Feet Tours' recording of 'Heroes & Laments': Kankawa Nagarra (Olive Knight)'s unique blend of gospel blues, mixing the traditional stories and language of the Walmatjarri people with a contemporary musical style. The release of the album followed an intense fortnight working with professional session musicians in the Desert Feet studio in early 2015 - rehearsing arrangements, selecting songs and producing an inimitable product which is marketable in its own right but also stands as a rare and important cultural monument for the Walmatjarri people. Heroes & Laments was professionally recorded and engineered by James Newhouse of Reel2Real studios and features renown artists Lucky Oceans, Dave Mann and Steve Pigram. The sell-out launch of the album at The Ellington in Perth on April 1 2015 was an overwhelming experience for Olive, performing with a highly professional band in a world-class venue that created the perfect backdrop to celebrate. 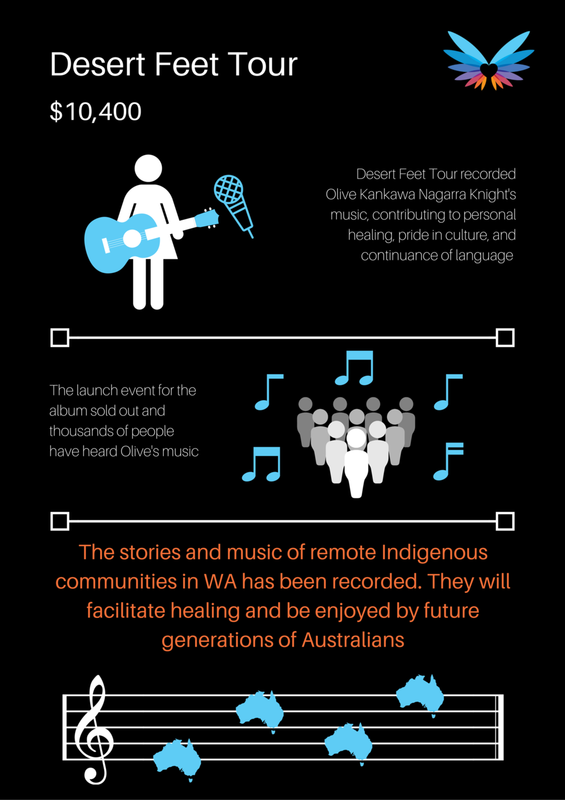 DFT boasts that Olive is the only Walmatjarri gospel blues singer in the world - and to sponsor this rare talent allows it to resonate with her people and let them know that their language and culture are valued. The artist herself discovered a new vocal strength through the project and received an invitation to perform at the Nannup music festival following the release of Heroes & Laments. For DFT too, the opportunity to create this valuable addition to Australia's musical archives and showcase its offering and capabilities across new networks has attracted attention from other musicians keen to work with the not-for-profit label.